INTRODUCTION: My FBC review of "Chaos Space" contains a general introduction to the author and the series, including a discussion of the first novel "Dark Space"; for convenience I will use the setting part from there updated to take into account the action in Chaos Space so there will be inevitable (but hopefully not essential) spoilers for the first two volumes since the action is back to back, each novel continuing where the previous ones ends. The Sentients of Orion series hit its stride in "Chaos Space" when events moved beyond Araldis into the wider universe, though that novel kept within the Orion league and the Consilience space both multi-species polities but recognizable to sf readers. Here in "Mirror Space" intensity is raised to even higher levels when the action moves partly in Extropian space where "post-sentient" or transcendent species reside and we go beyond "the usual" in space opera and into true sense of wonder. CLASSIFICATION: Space opera at its best. SETTING: The general setting of the series is The Orion League of Sentient Species—OLOSS—a federated multi-polity, multi-race, technologically advanced, galactic civilization. However, the League’s neighbors are the strange and potentially hostile Extropian Planets, with only the famous “humanesque” Commander Lasper “Carnage” Farr's Consilience acting as a buffer between the two. The League believes in stability—some would say stultifying innovation in the process—and letting evolution take its natural course, so genetic modifications are strictly controlled as are DNA-altering substances. The Extropians on the other hand, want to accelerate evolution and become transcendent. However, they are dependent on League smugglers for much of the technology necessary in their evolution. Or so we are led to believe. “Baroness” Mira Fedor is a noblewoman of Araldis, a backwater planet with a macho “Latin” culture in which women are relegated to servant or breeding status. However, Mira has an innate “Talent” to meld with an advanced space-faring sentient life-form called a Biozoon that powers the most sophisticated interstellar craft available. So, Mira is quite an unusual woman for her culture and gets to pilot the one biozoon ship Araldis has under contract. The linchpin of "the visible" main part of the story, Mira's actions and the reactions they engender power the novel to a large extent. Jo-Jo Rasterovich is the loner, silent masculine type, piloting his own biozoon ship and working as a successful asteroid miner. Then one day, on the fringe of Orion space, he discovers a mysterious and seemingly all-knowing and all-powerful entity called Sole, which some believe is an incarnation of God. Famous or infamous forever as the “God-discoverer”, Jo-Jo finds his life turned upside down, especially after entering into an ill-advised partnership with Tekton. And to top it all unexpected infatuation strikes him, so he is dragged deeper and deeper into the action as the cynical "what's in it for me" person finds out he is compelled to try and help others. Tekton is an ambitious, hedonistic, and unscrupulous member of one of the most advanced Orion cultures. When Sole was discovered, it agreed to let OLOSS establish a research station near it, and to interact directly with selected league candidates called “tyros” or “Godheads” to whom it may bestow useful boons and powers if it so chooses. There is intense competition for the privilege of being a “tyro” and by judicious scheming Tekton becomes one and is granted some small favors by Sole. However, Tekton puts into motion an ambitious plan that may grant him unprecedented favor from the Entity, even though it involves sacking backward planets, killing countless innocents, ruining Jo-Jo and other collateral damage. However Tekton may not be as clever as he believes. Moving on, Thales is a very intelligent and handsome young man on the so-called intellectual capital of the League, planet Scolar. He is also completely impractical, living up to the Scolar reputation as a planet of “nerds”. With a penchant for older women, and actually married to the mature daughter of the Scolar’s “Eminence” leader, Thales seems destined for fame and achievement. But he finds Scolar stifling and wants to become a “Godhead” to the dismay of his wife and father in-law. On the run and living in the "real" world for a change, Thales becomes a sort of high-IQ ultimate bumbler, but his good looks and dumb luck may keep him for the expected quick demise. “Principe” Trin Rinaldi is a spoiled brat. Heir to the Araldis principate, his father planned to rip Mira's talent from her and transfer it to Trin. But the invasion and sacking of Araldis throws Trin into the thick of events as the new Principe who has to rally the resistance against the invaders. And to top things off, he falls in love with what the nobility of Araldis regards as an abomination, or at least an outcast—a half-human, half-alien Myo girl who proves herself quite resourceful in helping Trin and his followers & allies evade capture and death. Since the Araldis thread is my least favorite and I believe the least successful so far, I was very happy that Trin gets relatively little page count in the novel. Other important characters appearing in the series and this novel include the aforementioned “Carnage” Farr, his wayward sister Bethany who has a strange taste in men, Mira’s biozoon ship Insignia, and her mercenary allies, powerful Orion officials and various Extropian "post sentients". FORMAT/INFO: “Mirror Space” stands at 395 pages divided over many small chapters prefaced by the name of the POV from which the action is seen. As in "Chaos Space" there are five threads corresponding with the five POVs: Mira, Trin, Thales, Jo-Jo and Tekton, with cryptic interludes from Sole. The narration takes place simultaneously in the novel’s present with the threads converging again towards the end and this time the novel ends on a "Peter Hamilton scale" cliffhanger making the conclusion to the Sentients of Orion series, “Transformation Space” tbp in 2010 a highly awaited novel. ANALYSIS: Since I want to try to keep series spoilers at a minimum, I will forgo a discussion of how the threads from Chaos Space continue here since after all that novel ended on a (moderate) cliffhanger too. Suffice to say that in time, that cliffhanger is resolved though not exactly the way we may expect, but events start moving very fast overtaking what came before. The novel is very fast paced and once I re-read Chaos Space - I thought the reread necessary to reacquaint myself with what has gone before and to immerse in the wonderful universe of OLOSS - I could not put it down until I finished it some hours later, so fast it goes. Sense of wonder, hair rising escapes, intrigue and direct action combine into a novel that keeps pushing the acceleration pedal until the suspense almost becomes unbearable and you *gotta finish* it and then re-read at leisure and get the missing details. As mentioned above Mira is the most memorable character in "Mirror Space" and in the series as a whole and she is the linchpin of the action, though I liked Jo-Jo's arc quite a lot too, maybe due to the fact that it takes him also into Extropian space and there lies the heavy part of the"sense of wonder" that makes space opera my most favorite sff sub-genre. I was surprised by Tekton's arc since he was set as a villain in the first two volumes, but more and more we realize that nothing is as it seems. Still arrogant and insufferable to a large extent and begging for comeuppance, Tekton started growing on me since as also mentioned above, it turns out he is not so clever as he thought. For now Thales' story seems less essential to the overall arc, though I see why his introduction was necessary as a new POV in volume 2 and of course I expect Transformation Space to keep surprising me. Thankfully we see little of Trin, though even he may be redeemed in what follows. 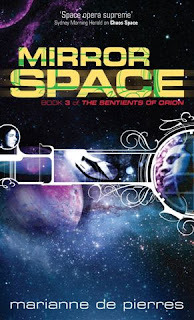 I strongly recommend the Sentients of Orion series for any space opera or sense of wonder sf lover, though he/she should start with Chaos Space or even better, Dark Space. Otherwise you will be missing on what is fast becoming one of the most accomplished and best modern sf offering out there. And as a bonus, once you immerse into the setting, the novel is fast and reasonably short, so no fear of having to trundle through a door stopper here. Great review as always, Liviu, I'd forgotten that was a four book series. I'm wondering what your top 3-5 books, any genre are at this point, Liviu? Thank you for your kind words - I expected this one to be a trilogy too but last year I found out there will be 4 volumes. Also my list with opening lines has more big time favorites, so I really cannot name few novels. Oh sorry, I meant top books of 2009.